During our stay at Patong Beach, we went to Banzaan Market to have the final dinner of our Phuket-Krabi trip. The seafood meal we had was a wonderful way to fulfill our gastronomic desires. Quick Review: Banzaan Market offers a variety of fresh food, and what makes it unique is that these fresh food can be cooked on the spot. Affordable price and the food cooked is delicious! Honestly, this place beats Lae Lay Grill Seafood at Krabi hands down. Furthermore, we didn’t come across any Thai food as fabulous as this! Read on, and let me tell you why. 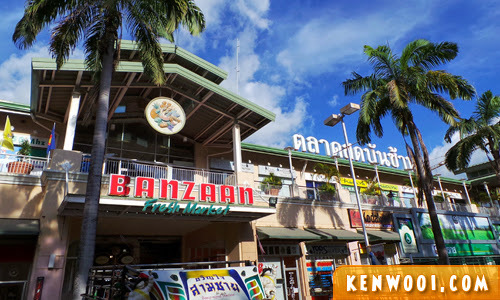 Banzaan Market is located in the middle of Patong city, and Jungceylon Shopping Mall is a nearby landmark. It’s quite a walking distance from Seven Seas Hotel, the place we stayed at Phuket. Inside Banzaan market, shoppers will notice sections for fresh food, meat, seafood, and vegetables. All can be purchased at very affordable prices, and you can get them cooked at the same place as well! 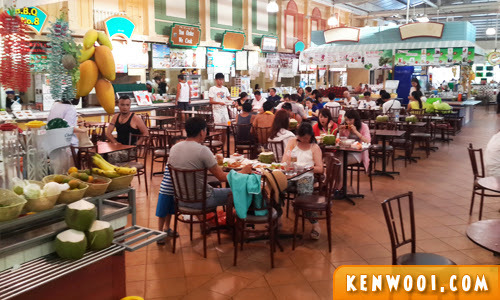 Just purchase your choice of fresh food at the market, and bring it up to the food court (second level) to get them cooked based on your preferred style. You can try to negotiate for a better price, but the prices are clearly stated at the stalls. 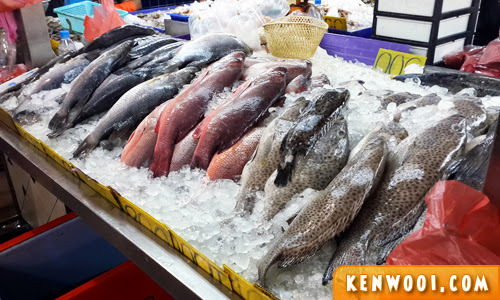 We bought 2 seafood from the market – squids and prawns (500g each) for about THB300 (RM30.84). The portion sounds reasonable for 2 persons, but in fact it could feed up to 4 persons. 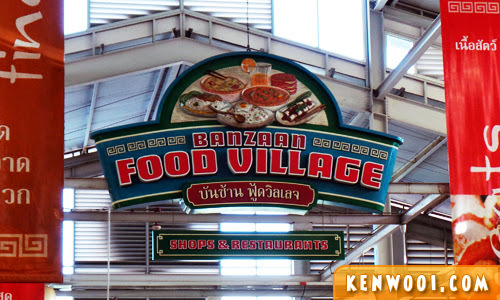 Anyway, the food court is called Banzaan Food Village. It’s a simple food court with comfortable dining space and quick service. Majority of the patrons dining here got their food cooked by the stalls. That’s the attractive feature of Banzaan Market. 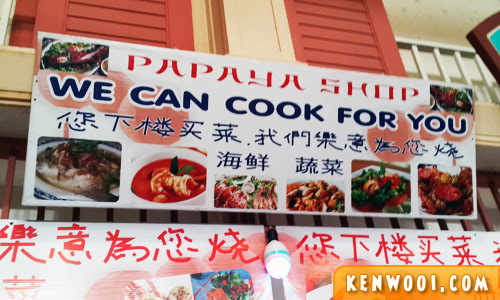 There are several stalls that offer cooking services. 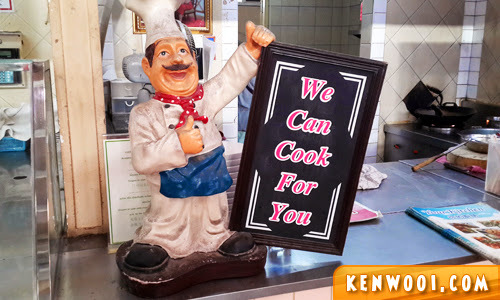 “We Can Cook For You” – that’s the phrase that is commonly seen around the food court. We went stall by stall to ask for the best price, and to also find out whether they have the cooking style that we prefer. We ended up selecting Stall 3 & 4 (if my memory doesn’t fail me) to cook for us. The guy was friendly and gave us a reasonable price for the cooking service. 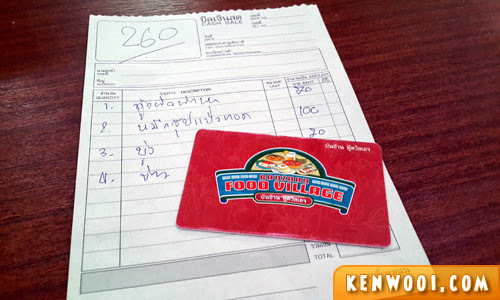 We were charged THB260 (RM26.73) for the cooking service, a plate of vegetable and white rice. To pay, patrons have to exchange cash into a prepaid card. The food stalls are not allowed to accept cash as payment. The prepaid card can be obtained at a booth nearby. You can load it with the exact amount needed to pay, hence there won’t be any balance in the card. It took about 10 to 15 minutes for them to prepare the food. 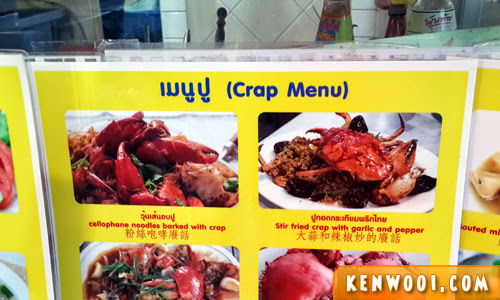 So here’s what we had for our last dinner in Thailand. 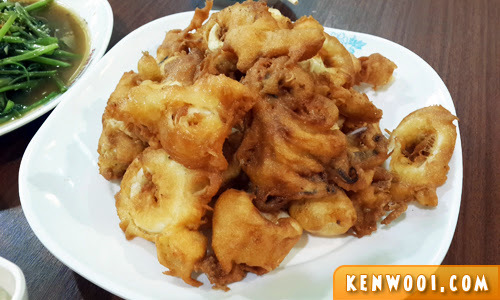 Deep-fried squids! My favourite – just perfectly done! 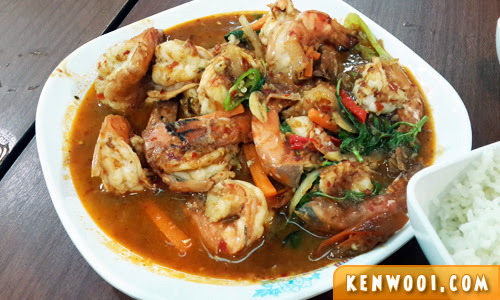 Thai-style prawns. Slightly spicy but manageable. 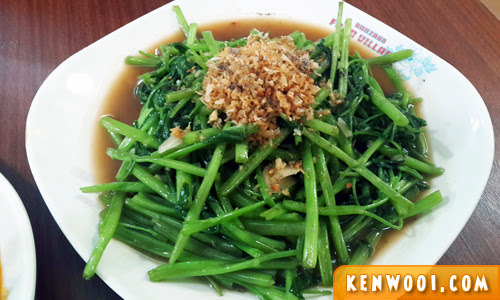 And the additional vegetable (we didn’t buy this from the market) was stir-fried kangkung. Overall, it was undoubtedly a splendid meal. The food were super delicious and we had a wonderful dinner. Yes, the portion was huge and we somewhat overate, but it was all worth it. The total bill was THB690 (RM70.93) inclusive of 2 ice-blended fruit drinks and 1 coconut drink. Damn cheap, right? I’d definitely recommend it to anyone who visits Patong. It’s a must-go place to have a dinner cooked with your choice of fresh food. Besides that, there is a night market just around the entrance to Banzaan Market. By the way, the market sells a variety of other choices such as lobsters and crabs – which are more expensive that what we had. I love Thai food. The prawns looks so so so good. My girl would love the squids – she loves anything deep fried, young people like that, I guess. 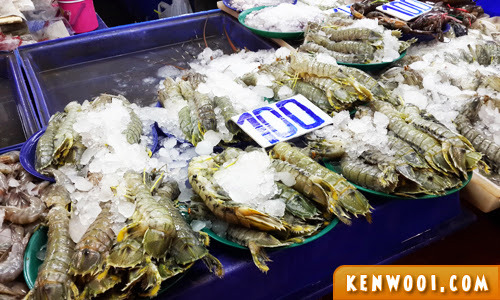 That big plate of mantis prawns only sold at 100baht, that’s really a steal!